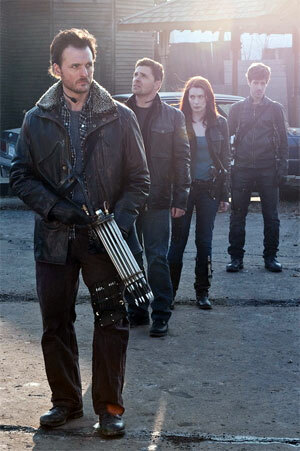 With a cast of familiar faces (at least to me), SyFy’s movie of the week Red: Werewolf Hunter proved to be an entertaining take on the werewolf sub-genre. Quick Aside: Although the movie was promoted as telling the true story of Little Red Riding Hood, there was no mention in the movie at all about that link. Visuals suggest that the story was inspired by the children’s fairy tale, but nothing except the promotions made it explicit. The title character, Red, comes from a long line of werewolf hunters. She wants to have something of a normal life, so as the film gets going she is bringing her fiance home to meet the family. Of course, the truce with the last remaining werewolve pack has been broken by a new kind of werewolf and, as you might imagine, things don’t go according to plan. 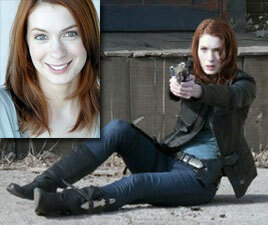 Felicia Day plays the title role, a good fit given her natural red locks. Day played a recurring character in episodes of Buffy the Vampire Slayer and a more recent role in Dr. Horrible’s Sing-Along Blog. Some might even remember her from playing Mag in two episodes of the short-lived TV series, Dollhouse. Day was able to bring both strength and frailty to the character of Virginia “Red” Sullivan and is one of the reasons I think the movie worked so well. Of course, the writing was smart, punchy and actually brought this B-movie to “top of the B’s” status for me. There wasn’t so much cheese in this film as there usually seems to be in SyFy movies-of-the-week. The special effects were decently done and used strategically. Most of the tension was created by lighting, blocking and storytelling. The settings and location also played a big role in creating tension. And, the movie was well cast. Joining Day were Kavan Smith as the fiance Nathan, Stephen McHattie as Gabriel the villain werewolf, David Reale as the younger brother Jake, Greg Bryk as the older brother Marcus and Rosemary Dunsmore as the matriarch of the clan. 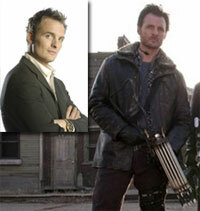 Smith will be a familiar face to Stargate: Atlantis fans for his role as Major Evan Lorne. But he’s been making regular appearances on a variety of genre shows, including The 4400 (Jed Garrity), Sanctuary (Det. Joe Cavenaugh) and a delightful Deputy Andy the android on Eureka. I have to say I’m loving him in that role. As the fiance who gets dragged into the secret werewolf underworld, Smith brings both a charming innocence (which his almost baby face supports) and a shoot ’em up toughness (which his chiseled good looks supports) to the role. His transformation from cell-phone addicted fed to budding werewolf hunter is quite believable. McHattie has been popping up in a lot of shows I watch lately, including the very short-lived Happy Town and SyFy’s new series Haven (please be renewed for next season, please). Interestingly enough, those two shows are very similar. Anyway, McHattie is no stranger to genre shows, probably because of his well-lined face and gaunt figure. He does creepy very well. And he made the character of Gabriel come to life for me. Digging up his history on IMDB, I found that he was in the 1975 film, The Ultimate Warrior starring one of my favorite actors, Yul Brynner. Other genre fare include The Hitchhiker, Tales from the Darkside, The Twilight Zone (1989), Beauty and the Beast (in which he played a character also called Gabriel), Quantum Leap, The Dark, Highlander, M.A.N.T.I.S., The X-Files, Theodore Rex, The Outer Limits (1996), Star Trek: Deep Space Nine, Poltergeist: The Legacy and several more. Reale was a new face to me … having missed everything he’s ever been in since 1999 (according to IMDB). Of course, there wasn’t anything that was genre, so I’m letting myself off the hook. His character as the quirky but likable younger brother added comic relief. As soon as the older brother played by Bryk was introduced I knew I had seen that face before, but couldn’t quite place it. In this film he’s a rough and tumble manly-man with facial hair. I knew him from ReGenesis in which he played a clean-shaven, well-groomed, almost metro-sexual administrative assistant. Amazing what a little facial hair and wardrobe change can do for a man! Anyway, if you haven’t seen ReGenesis, you may recognize him from brief spots on The Dresden Files, Blood Ties and Happy Town. He also has been in a few genre films, including The Incredible Hulk, Saw V and Saw 3D (reprising his role from Saw V). Finding out who played the grandmother turned out to be a bit tricky. Dunsmore is not credited in IMDB, but her face was very much familiar to me. She lent gravitas to the role of the grandmother. And, I believe, helped bring the movie up a notch. Her genre appearances include Twins, The Twilight Zone (1988), Beauty and the Beast, Total Recall, Robocop (1994 TV series), Poltergeist: The Legacy, Dreamcatcher, ReGenesis and last year’s horror film Orphan. The locations also played a major role in the ambiance of the movie. There is the big family home in the middle of no-where and the ghost town, Twin Rivers, where much of the battles with werewolves take place. The family homestead wreaks of history … this is a believable place for werewolf hunters to make their stand. And Twin Rivers? I can say I wouldn’t want to be stranded there at night! Red: Werewolf Hunter was entertaining and I’d recommend catching it when it re-runs on SyFy or renting in from Netflix when it becomes available.